OAKLAND SUPERCROSS RESULTS: COOPER WEBB IS FOR REAL! Cooper Webb proved that last week’s win was no fluke as he dominated round four of the 2019 Monster Energy Supercross season at Oakland. He led every lap of the main event, at one point enjoying a nine second advantage. When it was all over, he walked away with his second overall victory and the points lead. 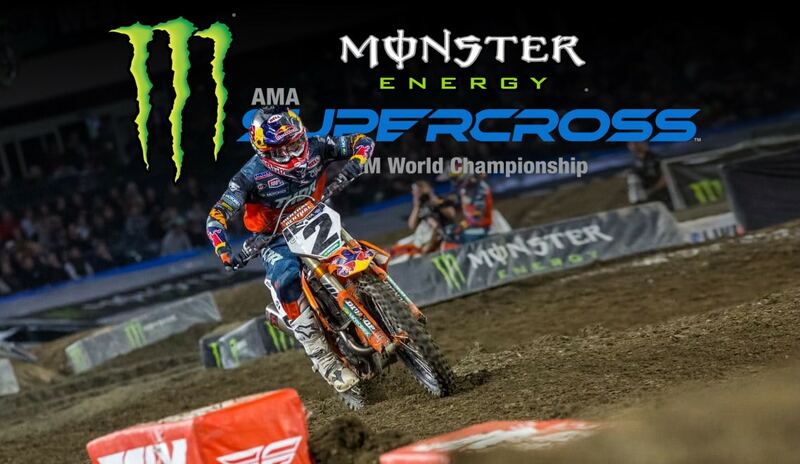 It was also a very good race for his Red Bull KLTM teammate Marvin Musquin. Marvin started up right on Webb’s rear fender, but then made some mistakes in the middle of the race that caused him to drop back. He passed both Ken Roczen and Eli Tomac on his way back to the front, and ended up right back where he started, right behind Webb. Blake Baggett might have had the best race of all. He started in 17th place and worked his way on to the podium, making for a KTM sweep. In the 250 class we got to see a cool and collected Adam Cianciarulo back in top form. He got in front early and led every lap of the main event, even though he had a few sketchy moments earlier in the race. It was a great race for Dylan Ferrandis, but a so-so start in the main event meant he had to work hard throughout the race to make up time. In the end, he was close, but not close enough. His teammate Colt Nichols rode a good enough race to keep the points lead for yet another week.